Raymond the wild raven has obviously picked up some interesting sounds and he definitely seems to be enjoying being an entertainer with them! If he could learn to say, "Hi, I'm Raymond," and met other humans in the same way, that would be great! ﻿ However, little is known about their social skills. 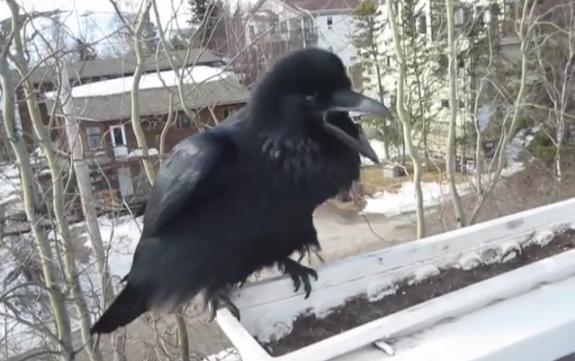 A new study shows that ravens are socially savvier than we give them credit for. They are able to work out the social dynamics of other raven groups, something which only humans had shown the ability to do. ﻿ Some notable feats of problem-solving provide evidence that the common raven is unusually intelligent. Over the centuries, it has been the subject of mythology, folklore, art, and literature. ﻿ In many cultures, including the indigenous cultures of Scandinavia, ancient Ireland and Wales, Bhutan, the northwest coast of North America, and Siberia and northeast Asia, the common raven has been revered as a spiritual figure or god. Responses to "(Amazing) Wild Raven Comes To Talk With Old Man"
Been there, know that annoyance...this night in particular. I found that Ravens (crows) like peanuts when this past summer when i was sitting on my back patio eating peanuts, a crow lighted down on a small table and wouldn't leave. From that day on he has been a constant companion. At times he brings a friend or two. I wish I knew what those sounds meant! I feed the neighborhood crows almost every day and we're developing a relationship. Sometimes there are 20 or so sitting in my maple tree waiting for me. But I don't know anything about ravens. This was fascinating! Fantastic!!! Such amazing, wonderful birds. I wish to know what it is saying. Amazing, beautiful conversation, so sweet.